How Can I SEO My Site? Home/Online Marketing, SEO/How Can I SEO My Site? In 1991, Tim Berners-Lee (inventor of the World Wide Web) brought the first website to life in from a lab in the Swiss Alps. It didn’t take long for businesses and bloggers to crowd the Internet. Websites brought the need for indexing them, which brought Excite (1993), Yahoo (1994), and Google (1997). -And as these things go, search engines brought the birth of search engine optimization AKA SEO. 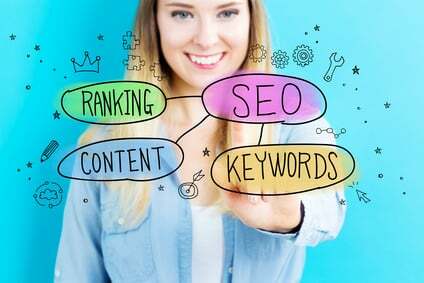 As soon as business owners get online and hear about search engine optimization, their first question is, “How can I SEO my site?” Answers to this question have varied widely through the years, for many reasons. The main reason is because search engines have changed drastically since their inception (for Google, it’s called the Google Dance), and optimization tactics have changed with them. In today’s post, we break down the very basics of how to optimize your site. Keep in mind that this is an overview to get an idea of what needs to be done to your website; this is not the whole kit n’ caboodle. Once you have ascertained the areas that need work, create a campaign that outlines how you plan to touch up those areas. The keywords and phrases you use are the basis of your entire SEO campaign. Get them wrong, and no matter how much work you do, you can miss out on a lot of potential customers. Keyword research allows you to find out how your visitors find information and a better understanding of how to focus your content. “Geo-targeting” simply means targeting specific areas. If you choose to geo-target, you must also decide where you want to (such as zip code, city, state or country). Example: If you are targeting people in the U.K., you might use British English instead of American English and idioms (i.e. color vs colour). You might want to provide translations for various countries, or content specific to a location. When researching keywords, pay attention to which version has more people searching for it. However, don’t forget to look at whether you can naturally use the form you chose. Example: “Specialist” may be used more often than “specialists,” but the singular version may not fit the content. Although this point has been argued about, the order of words in the search term does matter. Lesson 1.5 of Google’s “Power Searching with Google” course tells users that word order matters in the results they receive. If it matters to what users see, it matters what marketers use. The closer to the beginning of a title, description or heading, the more prominence (or weight) a word will have to the search engines. Example: “SEO professional” brings back different results than “professional SEO”. Keywords – generally one or two words with a high search volume. The problem with using only keywords is that the wider the term, the less chance of getting targeted traffic. Example: Someone searching for “golf” may be looking for courses, clubs, shoes or clothes. Key phrases – generally two or three words that help narrow down the overall search term. Long tail keywords – multiple keyword strings of at least four or five words with an extremely tight focus on your specific product. Example: “high quality golf clubs, equipment, shoes and accessories”The long tail keywords not only include the long tail, but also can be broken down into several other quality search terms.Example: the long tail keyword example also has “high quality golf clubs”, “golf clubs”, “high quality golf equipment”, “golf equipment”, etc. The easy part of keyword research is creating a list of possible, relevant keywords to use. You know your industry, or should, and you know what your site will be about, or should. The hard part comes when you start researching to find out what terms the visitors use. Remember, most are laymen – that’s why they’re looking for you. As an example, we’ve dithered back and forth over whether to use “organic SEO” as one of our key terms. We know what it means, but what does it mean to people searching for SEO providers? Is it a positive addition or a negative one? These are things you’ll also need to consider while researching. The best place to start is with a key word. Ask yourself, “What is my industry?” Then, ask yourself what visitors might call your industry. Develop keyword clusters, or groups, about a topic or subject using the answers. The main keyword in each group becomes the main keyword for your site’s high-level directories. URLs – Using keywords in URLs is a fairly easy concept to understand. Not only does this help the search engines get an idea of what the page is about, but it also helps the visitors. Which would you be able to understand better, example.com/1234/5678 or example.com/golf/clubs? If possible, always use the main keyword for the page as the page’s url. Meta Titles – While the meta titles are somewhat important to the search engines, they’re even more important to the visitor. You see this part at the top of each search snippet. Using keywords in the title is all well and good, but make sure the title is enticing to visitors and relates to the search term they used, not necessarily the search term you think they should use. Don’t sacrifice the reading quality just to make the search engines happy. Lastly, never use the same title tag on more than one page. 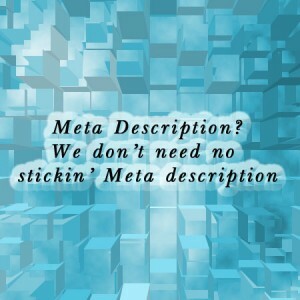 Meta Descriptions – Description tags must be informative, enticing and clickable. The first view visitors will have of your site, the description is your business card. The worst mistake you could ever do is stuff it full of keywords. This is marketing at its most powerful: don’t waste in on search engines that can’t buy anything. This is a basic introduction to titles and descriptions. We highly recommend a more indepth article, 10 Building Blocks of Great Meta Tags. Do an audit of your content. Does it match the key words/phrases you’ve chosen for each page? Did you spend so much time trying to target search engines that you forgot about your visitors? The rule of thumb for content optimization is this: If you’re forcing your keywords to fit the content, either change the content, or change the keywords. No matter how many visitors you get, it won’t do any good if they don’t convert and follow through with what you want them to do. Your description may get them there, but the content does the work. It’s imperative, for the purposes of growing your business, that your content is visitor-friendly. Yes, use your keywords or phrases in the content, but always – always – use them as they fall naturally. If you haven’t already, add Google Analytics to your page. 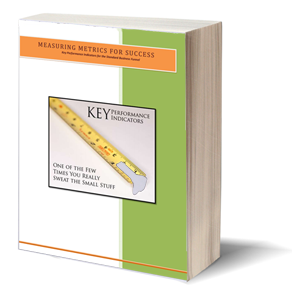 Take three months and watch what comes back from the reports while doing keyword research. Once you’ve gathered all the necessary information, spend another month creating an SEO campaign based on the reports. Your campaign can include anything from changing keywords, titles, descriptions and content to article marketing, link building, social networking and more. In conclusion, remember that good SEO takes time, patience and basic knowledge (and good advice!). It’s trial and error, even for the best of us. You may find yourself with #1 ranking for a search term that no one searches for, which doesn’t do you any good. If something goes wrong, take a deep breath and dig into research again. SEO isn’t magic; it’s science. The answers are there! If you’re struggling with your SEO campaigns, contact Level343. We offer many levels of service, including consultation, campaign support, campaign creation and implementation. We come in where you need us most.